Railpictures.ca - Marcus W Stevens Photo: I have never gotten a chance to photograph OSR switching this far west on the Southern Guelph North spur, but after talking to the crew it appears they switch here quite often. AOC Canada specializes in resins and take in quite a few tank cars a week. OSR GP9U 1591 and RS23 504 have a few switching moves to perform before pushing their train back to the interchange between OSR and GEXR where the line meets the Fergus spur. | Railpictures.ca – Canadian Railway Photography – photographie ferroviaire Canadienne. 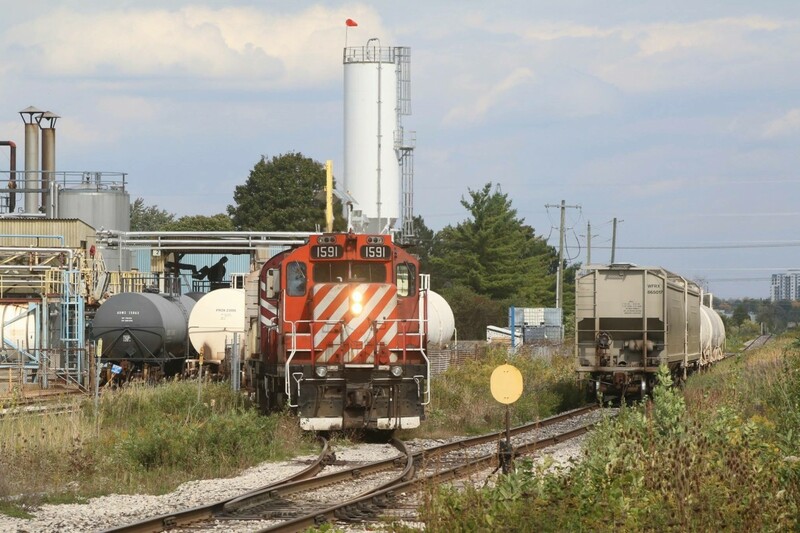 Caption: I have never gotten a chance to photograph OSR switching this far west on the Southern Guelph North spur, but after talking to the crew it appears they switch here quite often. AOC Canada specializes in resins and take in quite a few tank cars a week. OSR GP9U 1591 and RS23 504 have a few switching moves to perform before pushing their train back to the interchange between OSR and GEXR where the line meets the Fergus spur. AOC is switched a couple times a week at least. Any cars that come in via GEXR have to be handed to OSR to switch this place, it’s one of the few that only OSR switch as well as PDI Massey Rd behind you regardless of who sends the cars in. PDI is also switched very often probably 4-5 days a week. What’s great about AOC is it’s one of the few spots to get good light when they are switching it.. in sun of course.